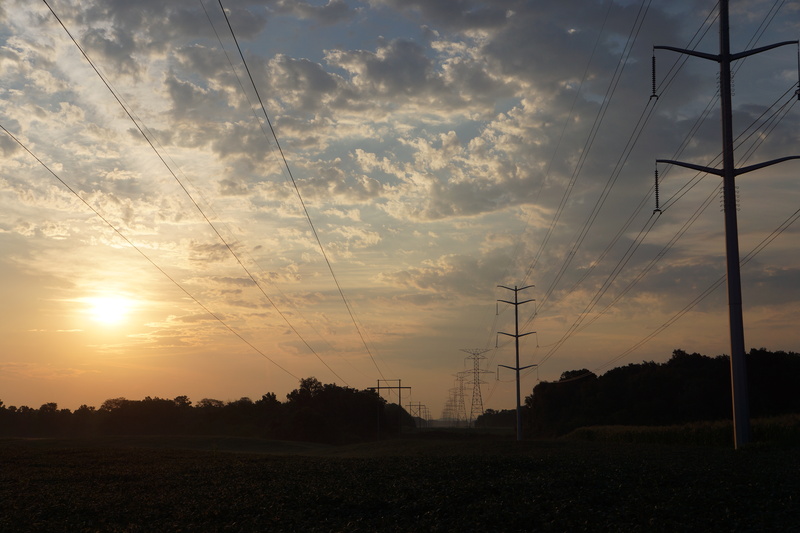 Mile 1: As I was leaving our lodging in Milan at 7 am, this was a view I enjoyed and decided to photograph. Without a doubt today was the most unpleasant day of biking of the entire tour so far (and I hope never repeated). It wasn’t even the high temperatures and humidity that left me with such a opinion. It was the route! I find it hard to believe that the Adventure Cycling Association which selects and publishes the route believes this is the best route through the region. 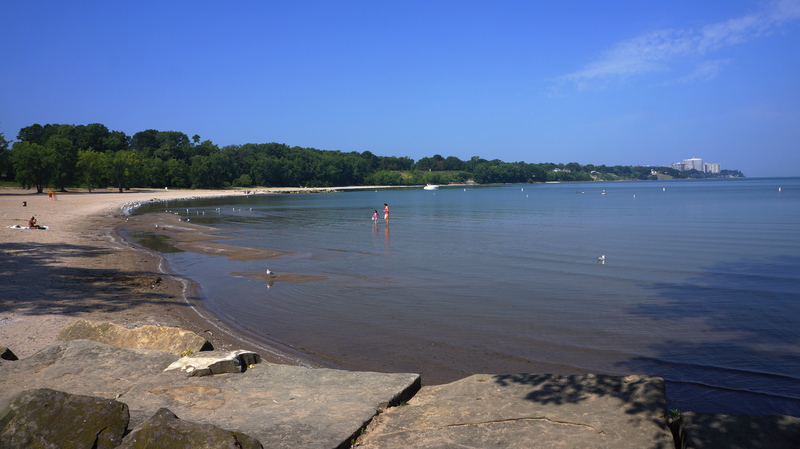 The first 15 miles of biking was on country roads or next to vacation homes located on Lake Erie. This was the highlight of the day. The great roads and traffic I had experienced in Ohio up to this point disappeared. About 40 miles from Cleveland the biking experience significantly deteriorated. First, the road became 4 lane with primarily industrial and commercial establishments – road shoulders if they even existed were covered in debris, potholes, gravel, and deep cracks. The traffic was heavy and constant with autos and trucks who had no interest in slowing down as we tried to navigate the road’s obstacle course. As I approached residential areas west of Cleveland (Bay Village, Rocky River, and Lakewood), I was expecting road relief, but didn’t get it. The road surface became even more cracked and jarring to bike, was uneven, and potholes were even more prevalent. The roads and the shoulders (if they existed) were narrow as well. Traffic was very heavy, but with more cars and less trucks, but no greater driver interest in slowing down as cars passed us closely due to on-coming traffic and the narrow roads. Then the real fun started in Cleveland biking the “Cleveland Lakefront Bikeway” which included biking through downtown Cleveland. Besides the continued bad road conditions, the route traveled through very run down neighborhoods (I passed two locations where police had individuals against a wall). Unfortunately, my limited view of downtown Cleveland with one exception provided no motivation to ever go back. 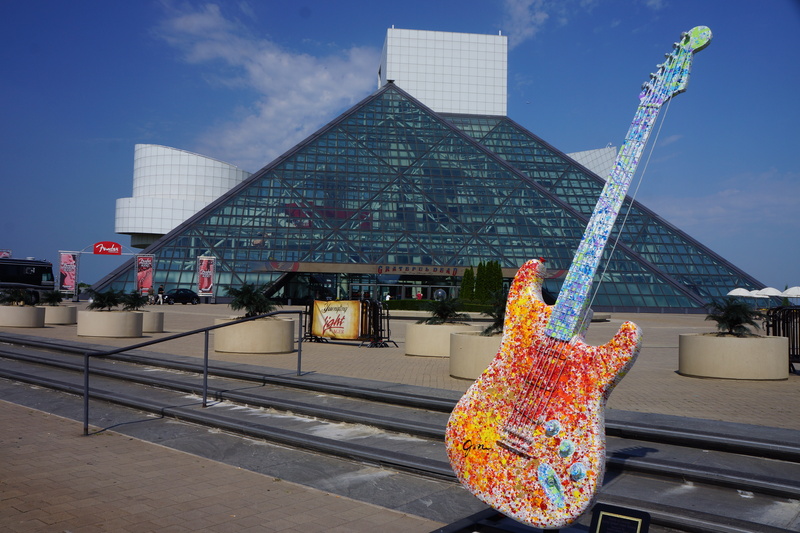 The exception was the Rock “N” Roll Hall of Fame which was near the waterfront and the the Cleveland Browns Stadium. The roads and bikeway leaving downtown Cleveland provided the worst riding conditions of the entire tour so far from nearly every perspective, road surfaces, traffic volume, rude drivers, construction, lack of shoulder, narrow roads which drivers didn’t feel hesitation in passing me without slowing down, and scenery. I had to stop for water at a convenient store and for the first time on the tour felt I needed to lock my bike before I went it due to the bars on the windows/doors of the store and the cashier behind a bullet-proof window. Glad the ride of over. 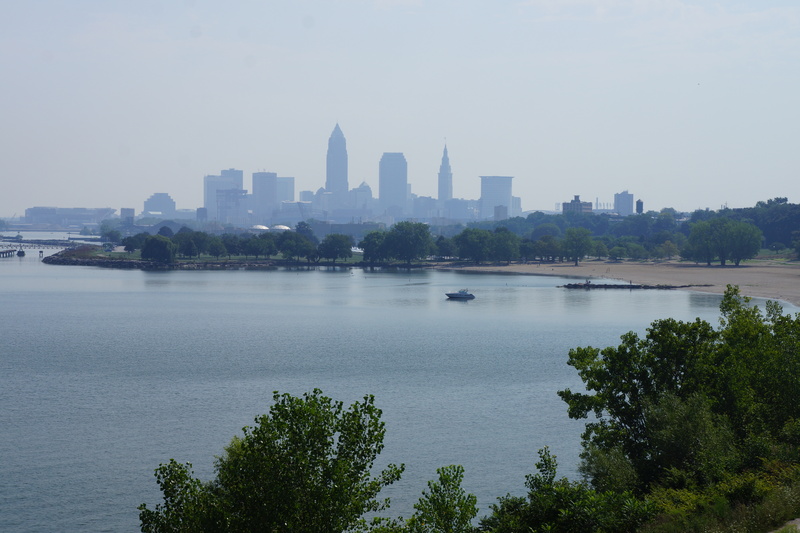 Mile 58: View of Downtown Cleveland and its lakefront beach park from Cliff Drive just west of Cleveland. Mile 59: View west from Cleveland Lakefront State Park (Cliff Drive is located just to the left of the high rise condo’s in the upper right of the photo). 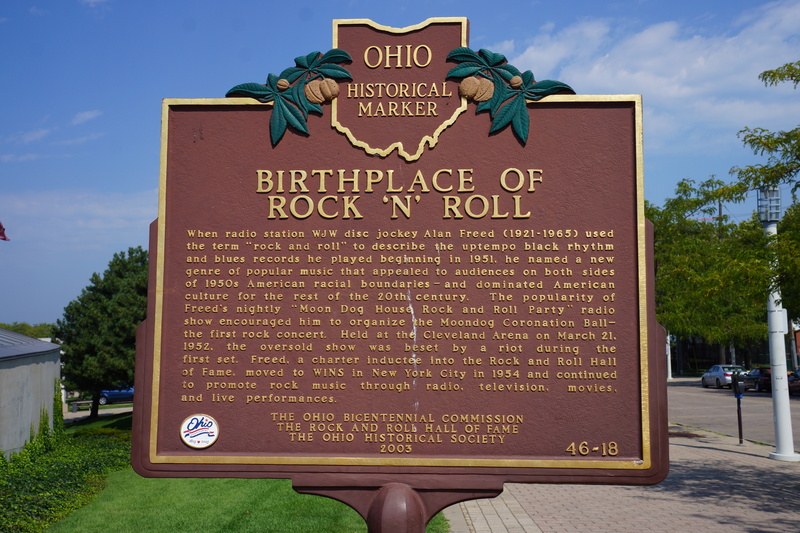 Mile 61: Historical Marker – Birthplace of Rock “N” Roll. 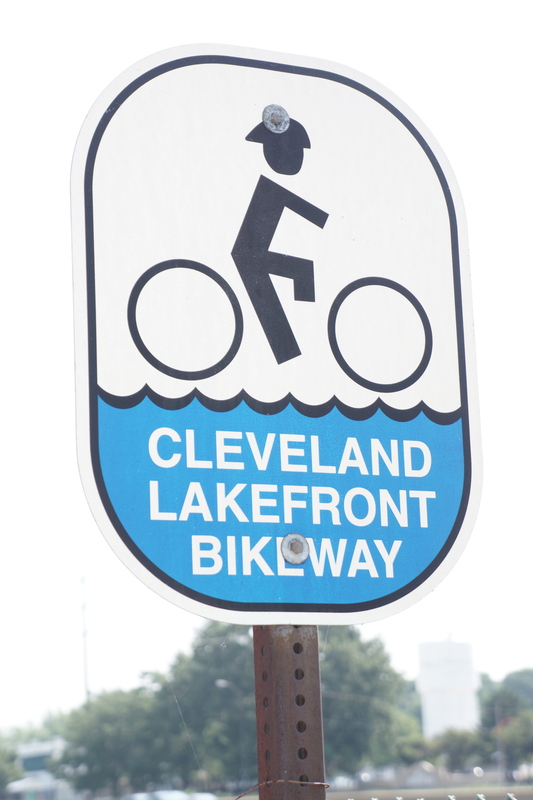 Mile 62: For many miles I biked on the “Cleveland Lakefront Bikeway”. It is impossible to believe that the City of Cleveland designated this route as a “bikeway” – it was almost impossible to ride due to the road conditions, and for the most part when shared with traffic, the drivers with little regard for bikers. The only attractive element of the path was the sign. Mile 64: Entrance to Burke Lakefront Airport Park. This entry was posted on August 3, 2012 by Steve. It was filed under Photograph of the Day . The trip was a nasty challenge but your photography is a joy! Yes. Erecting a sign does not a bikeway make. Sounds like those roads were ‘not suitable for biking’. I rode on a lot of them myself. I feel your pain. Without further research I’m not sure what the answer is. Don’t know if better roads are available. Glad you’re getting through it. This too shall pass.